An Ear full of Bling Remember the innocent days of having your single ear piercing and buying the earrings as a set? Well it’s time to move onto bigger & edgier things! One of our new favorite trends is the mix & match earring party that has been happening EVERYWHERE in the style world. 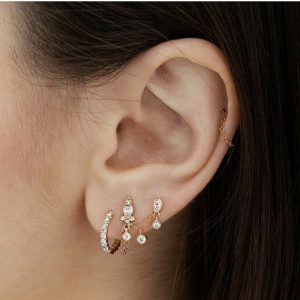 We at Cayman’s are ear jewelry lovers and sometimes it can be hard to choose, so why not choose them all? 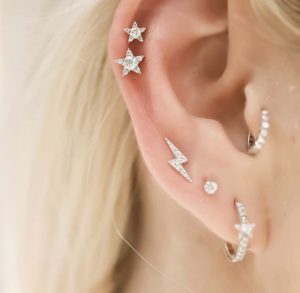 Having multiple ear piercings is something that has been around for decades and we’ve now decided to put a stylish play on it. With designers like Jude Frances, Maria Tash and Adina Reyter, stacking & mismatching has never looked so cool!